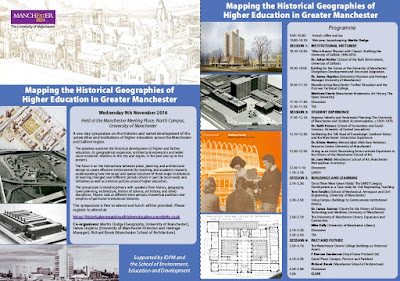 I am co-organising a one-day symposium on the 9th November examining the histories and varied development of the universities and institutions of higher education across the Manchester and Salford region. The speakers, in multiple different ways, focus on the interactions between place, planning and architectural design to create effective environments for higher learning and scholarly research. The flyer above has the programme of talks. The symposium is interdisciplinary with speakers from history, geography, town planning, architecture, history of science, art history, and allied disciplines. Papers look at different time periods, theoretical positions and empirics of particular institutional histories. The symposium is free to attend but please register. Organisers: Martin Dodge (Geography, University of Manchester), James Hopkins (University of Manchester Historian and Heritage Manager), Richard Brook (Manchester School of Architecture). Thanks for sharing the useful and informative posts with us.